In The Mason Jar, Clayton Fincannon is a Tennessee farm boy raised at the feet of his grandfather. He and his grandfather leave letters for each other in a Mason jar on his grandfather’s desk; letters of counsel and affirmation. When Clayton attends college in Southern California, he meets and falls in love with a dark, debutante, named Savannah. However, when an unmentioned past resurrects in her life and she leaves, Clayton is left with unanswered questions. A story about a girl who vanished, a former love who wrote a book about her and a reunion they never imagined. Written for the bruised and broken, The Mason Jar is an inspirational epic, romance, tragedy which brings hope to people who have experienced disappointment in life due to separation from loved ones. 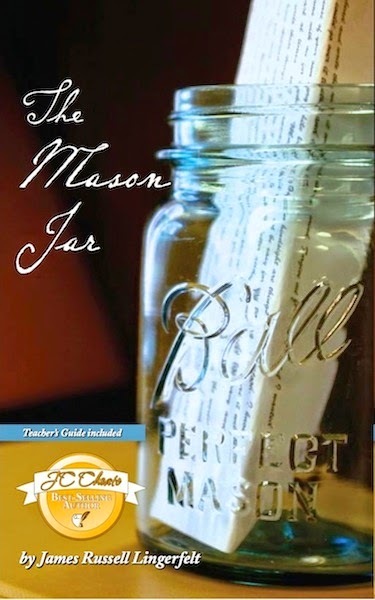 With a redemptive ending and written in the fresh, romantic tones of Nicholas Sparks, The Mason Jar interweaves the imagery of Thoreau with the adventures and climatic family struggles common to Dances with Wolves, A River Runs Through It and Legends of the Fall. Instead of fiction, this book reads more like a memoir, which in some ways, it is. A lot of the book is told in the format of Eden reading the book that Finn had wrote about his time with her and his time after her. It's Finn's vulnerability and openness that really drew me into this book and then it was his storytelling combined with his grandfather's wisdom that held me until the last word on the last page. While this book may not end up in my top 5 for the year (after all, I've lost count of how many books I have read), this is one that I wholeheartedly suggest that you find a copy, curl up with a mug of your favorite drink and lose yourself in its pages. I received a copy of this book for the purpose of this review..All thoughts, comments and opinions are my own.